1. A dose-response curve that corresponds to greater effects at low doses than implied by linearity; this is termed "supralinearity" (curve A). 2. 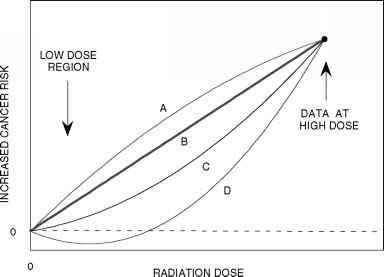 The linearity hypothesis, or linear-nonthreshold hypothesis, according to which the risk of radiation-induced cancer is proportional to the magnitude of the dose (curve B). 3. A linear-quadratic dose response, in which the risk is dependent on the sum of linear and quadratic terms. Depending on the relative importance of the two terms, the extrapolated risk may be substantially depressed at low doses (curve C). 4. A dose-response curve that takes on negative values at low doses, corresponding to a beneficial effect of small radiation doses; this is termed "hormesis" (curve D). 5. The existence of a threshold, below which there is no appreciable rate of cancer induction (not shown). 6. 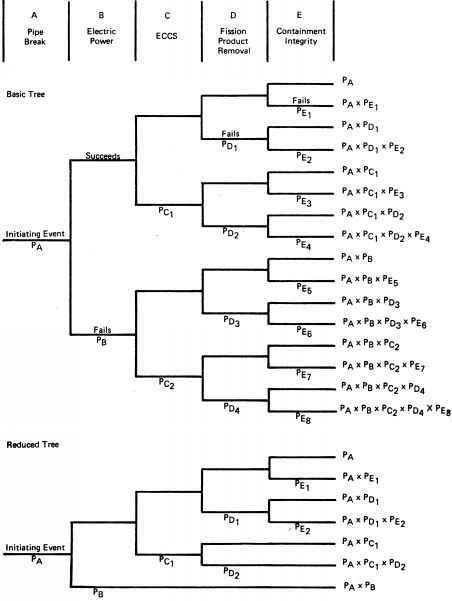 A reduced risk per unit dose at low doses or low dose rates (or both), which can be represented by applying a dose and dose rate effectiveness factor (DDREF) to the predictions of the linearity model (not shown). 13 The caution remains that this is based largely on doses received over a very short period of time. Fig. 4.1. Schematic representation of several alternative assumptions for the extrapolation of the cancer risk versus radiation dose to low dose levels, given a known risk at a high dose: supralinear (A), linear (B), linear-quadratic (C), and hormesis (D). Alternatives 3 to 6 correspond to reduced effects at low doses. Of these, the only one that has been adopted in major recent studies is possibility 6, the inclusion of a dose and dose rate effectiveness factor (DDREF). At an earlier time, as reflected in the 1980 BEIR III study, the linear-quadratic model 3 had been favored . Alternatives 1 and 4 are outside the mainstream of standard assessments, but this in itself does not prove they are wrong. In fact, as an increasing volume of research is accumulated, individual studies can be found that lend support to each of these nonstandard assumptions. However, they have failed to convince the leading national and international advisory bodies that any of the alternatives is to be preferred to the linearity hypothesis (except for the inclusion of a DDREF). The relative merits of the linearity hypothesis and of the several alternatives could, in principle, be determined from either conclusive observational data at low radiation doses or a fuller understanding of the damage mechanisms. However, as discussed earlier and implied by the persistence of alternatives, neither is available.